It’s a mystery why some pockets of the city become hubs of a particular type of cuisine, though it stands to reason that where a pioneer finds success, imitators follow. And so we have East 6th Street’s Little India, Lexington Avenue’s Curry Hill, and Ninth Avenue’s ever-burgeoning Thai town. To those culinary microcosms we add the Sichuan stronghold of the Thirties in Midtown South, a confederacy of hot-and-spicy Chinese restaurants that has evolved over the past decade to include establishments that lay claim to Flushing pedigrees, Michelin stars, and devoted followers who swear by one’s mapo tofu and another’s tea-smoked duck. The unassuming precinct has become a literal hotbed of Sichuan specialists, and a very good place to hone your taste for má là, the cuisine’s characteristic combination of a numbing, tingly sensation derived from Sichuan peppercorns and potentially incendiary chile-pepper spice. 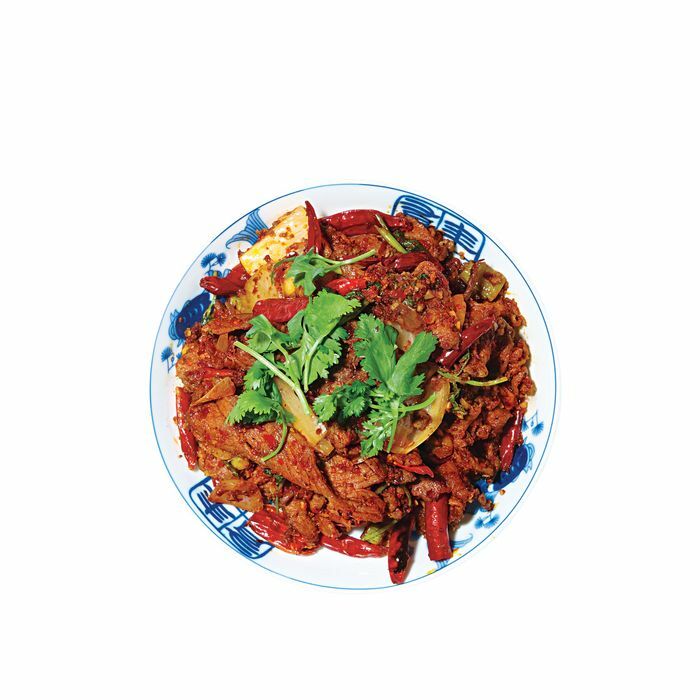 It’s also home to one of New York’s few Hunanese restaurants, which shares so much in common with its Sichuan neighbors in the capsicum department that we’ve chosen to include it in this roundup of New York’s new hot zone. The restaurant boasts one Michelin star, plus an ample and comfortable space. Curiously, the menu includes a few dishes—like a pad-Thai lunch special—that seem to give into Americanized “Asian”-food demands. Eat this: Ox tongue and tripe with chile-peanut vinaigrette ($8.95); hand-shredded chicken ($7.95). An extremely popular outpost of a mini-chain spawned in Flushing. Eat this: Double-cooked pork belly ($13.95); spicy cucumber salad ($5.95). Eat this: Chungking spicy chicken, flavored with bright-red chiles ($15); spicy cumin lamb ($19). The wait staff are friendly, and the tasteful space is furnished with a glass façade and hanging lanterns. Eat this: The slightly nutty, creepingly hot dandan noodles ($6.95); spicy cumin mutton ($16.95). Eat this: Their namesake dish, with chile minced pork ($10.95); camphor-tea-smoked duck, a Sichuan classic that’s typically smoked with camphor leaves, then fried ($17.95 for a half duck). This offshoot of Flushing’s estimable Hunan House provides an introductory course in a cuisine that can be as spicy as Sichuanese—or spicier!—minus the numbing quality of Sichuan peppercorns. Note the emphasis on fresh (not dried) chiles and smoked foods. Eat this: Sautéed sour string beans with minced pork ($12.95); steamed fish head with chopped chiles ($22.95). Eat this: Hot pot in the Chongqing style (from $6.95, plus accompaniments). *This article originally appeared in the May 13, 2013 issue of New York Magazine.